Searching for that perfect gift for the mystery fan in your family? Then look no farther than Acorn TV's boxed set of the superb British detective series George Gently. This show, which concluded earlier this year, consists of twenty-five 90-minute episodes that were broadcast over the last ten years. Yes, it's a stretch to write about it on a classic TV blog, but this is one series that will be a classic--plus its convincing 1960s setting will evoke plenty of nostalgia. Martin Shaw as George Gently. Martin Shaw stars as the title character, a veteran detective chief inspector for London's Metropolitan Police circa 1964. 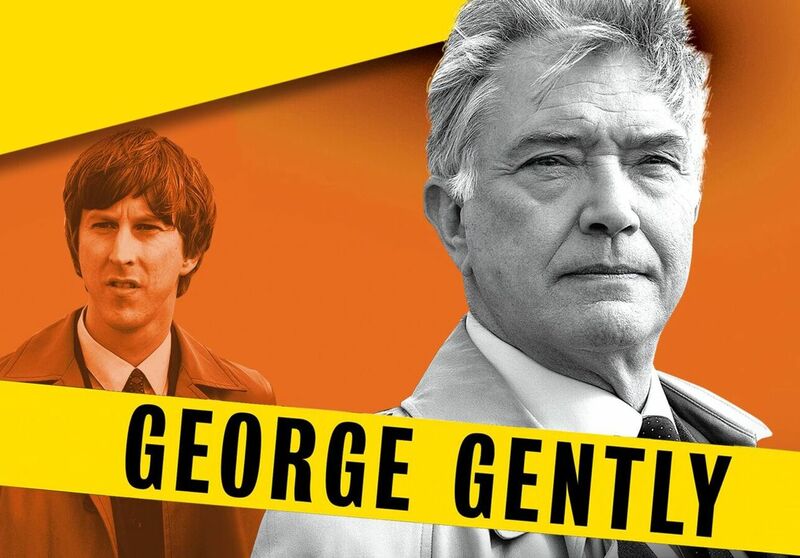 A highly-principled man, George Gently has been fighting corrupt senior colleagues--and his actions may have been responsible for his wife Isabella's recent death. When a snitch provides a lead to locating Bella's killer, George postpones his retirement to investigate a murder case in Northumberland. He is paired with a young, ambitious detective sergeant named John Bacchus (Lee Ingleby). Bacchus knows the locale and its residents, but he's also a copper willing to bend the rules in the line of duty. Yet, Gently recognizes promise in Bacchus, which leads the senior detective to postpone his retirement, transfer to Northumberland, and nix Bacchus' planned reassignment to London. Gently informs his new partner in no uncertain terms at the end of the first episode: "I've told you, Sergeant Bacchus, I'm chopping you down. You're staying here. With me." Lee Ingleby as John Bacchus. It's the constantly-evolving relationship between Gently and Bacchus that elevates George Gently above dozens of other British crime shows. The duo ultimately become loyal to one another and form a sort of father-son relationship. But Bacchus struggles to live up to George's expectations, especially when the older detective serves as the younger one's moral compass. The relationship becomes even more complex when a female police constable, Rachel Coles (Lisa McGrillis), joins the team in season six. Her open admiration and deep respect for Gently immediately puts her at odds with Bacchus. Lisa McGrillis as Rachel Coles. Don't go thinking that George Gently is all character study, though. The mysteries are tightly constructed and often integrated into the 1960s backdrop. The Cold War, riots, a holiday camp, and the pop music scene provide the background for some of the best episodes. As the series progresses, it moves from 1964 through the rest of the decade, with the final two episodes taking place in 1970. Author Alan Hunter introduced George Gently in his 1955 novel Gently Does It. He wrote a total of 46 George Gently mysteries with the last one being published in 1999. In the books, there is no John Bacchus, Gently is single, and he lives in Norfolk. The boxed set of George Gently includes numerous behind-the-scenes featurettes, interviews, and photos. 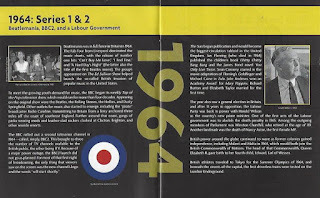 The best bonus item is a booklet describing key historical events in Great Britain for the years covered by the series. The booklet also contains brief text interviews with Martin Shaw, Lee Ingleby, Lisa McGrillis, and producer Jake Lushington. Key historical events in 1964--as described in the bonus booklet. When asked to describe George Gently in one sentence, Lushington states: "I would say that it's a challenging and entertaining detective drama that gives you a realistic snapshot of the 1960s, rather than a rose-tinted memory." I would add that it's marvelously acted, especially by Martin Shaw, and is a worthy edition to any mystery lover's video collection. Acorn TV provided a review copy of George Gently: The Complete Collection. It retails for $149.99, but you should be able to find it for much less, especially during the holiday season. I am so excited to hear your enthusiasm for “George Gently”! Martin Shaw is impeccable as Gently. You feel as if you are in the ‘60s watching a DCI who sincerely cares about justice and collecting evidence to reveal the culprit as opposed to choosing a culprit and manipulating the evidence to fit the culprit. This would make an excellent gift for anyone who enjoys the mystery/detective genre.